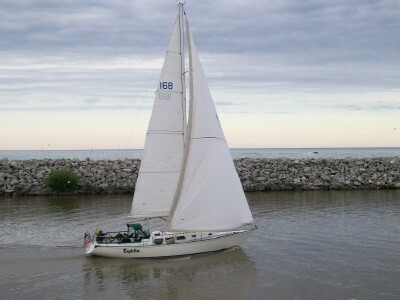 John Gauthier , owner, operator and licensed Great Lakes Pilot with over 30 years experience sailing guests like you and your crew throughout the waters of Lake Michigan, Lake Huron and beyond. From Illinois to Canada, from Detroit to Green Bay, Captain Gauthier knows the waters. 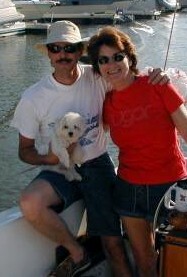 John is pictured on the right, with his wife and first mate, Shellfish, and their mascot, Pookie. “Espiritu “ –is a 41 ft. Newport sailing vessel with all comforts aboard; state of the art electronics, CD, DVD, HD stereo, HD TV , full galley with stove, oven, refrigeration and microwave. A private head (bathroom for you landlubbers), furling head sails, wheel steering, and powerful inboard to assure you an exiting trip and safe return. And much more.